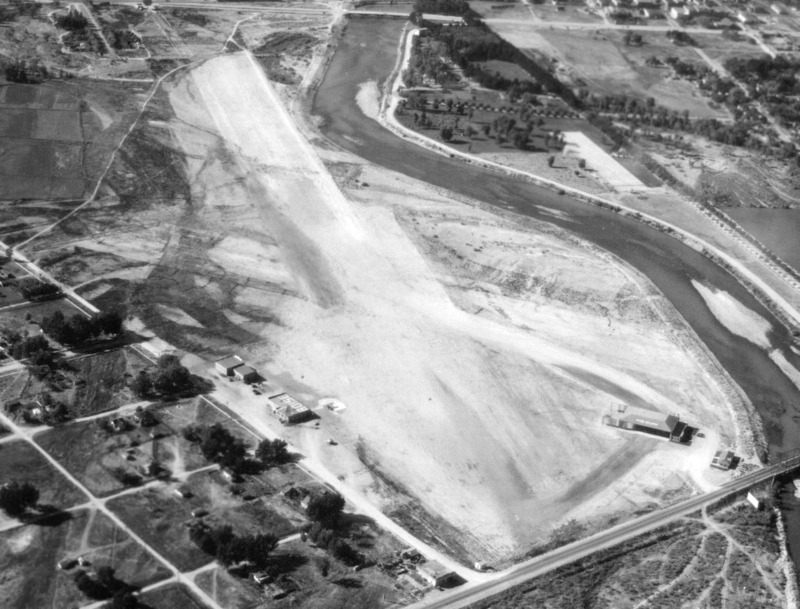 A 9/27/32 aerial view looking northwest at the original location of Boise Airport (courtesy of Blain Green). According to Wikipedia, “In 1926 the first municipal airport in Boise named Booth Field was built on a gravel bed where the Boise State University campus now stands. 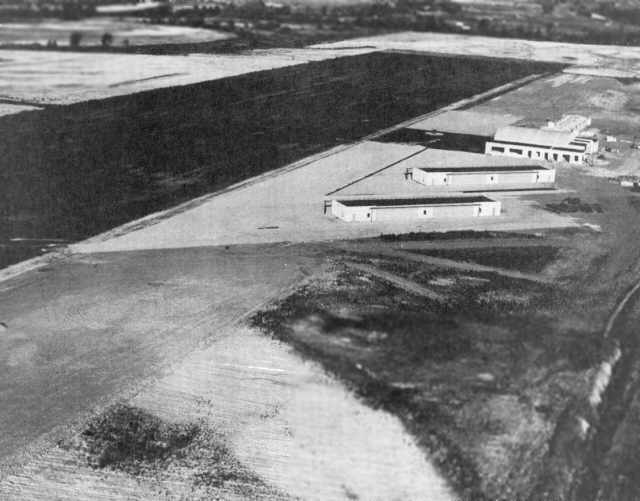 The first commercial airmail flight in the United States passed through this airfield on 4/26/26, carried by Varney Airlines. Varney Airlines began operating out of Boise in 1933, later merging with National Air Transport to become United Airlines. 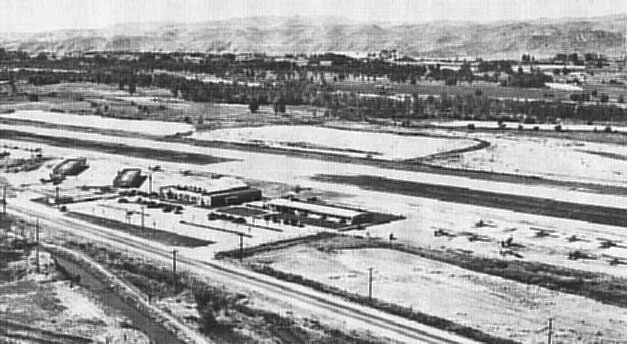 The earliest photo which has been located of the original Boise Airport was a 9/27/32 aerial view looking northwest (courtesy of Blain Green). and another hangar on the northeast side. 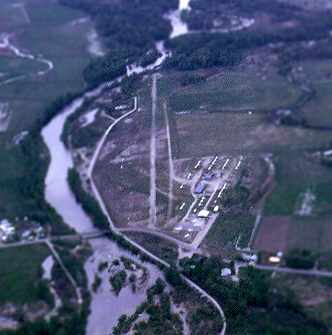 The Boise River formed the northern border of the airport. was on the January 1936 Boise Sectional Chart. 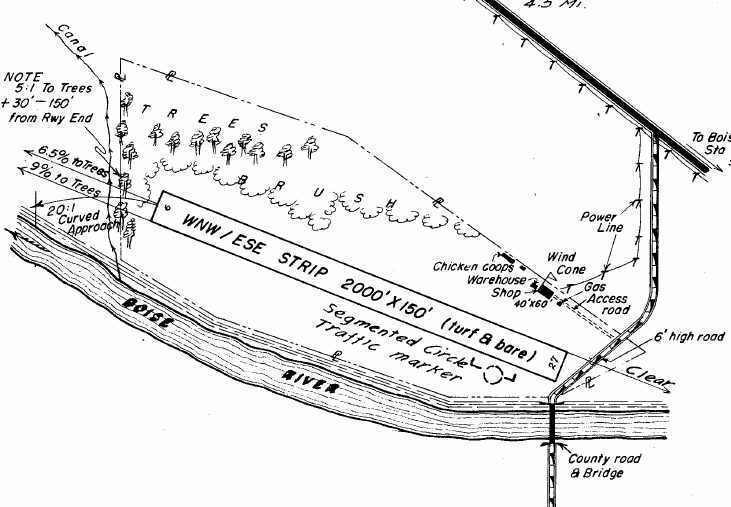 showed that another hangar had been added to the southwest side of the airport at some point between 1932-38.
was on the May 1938 Boise Sectional Chart. 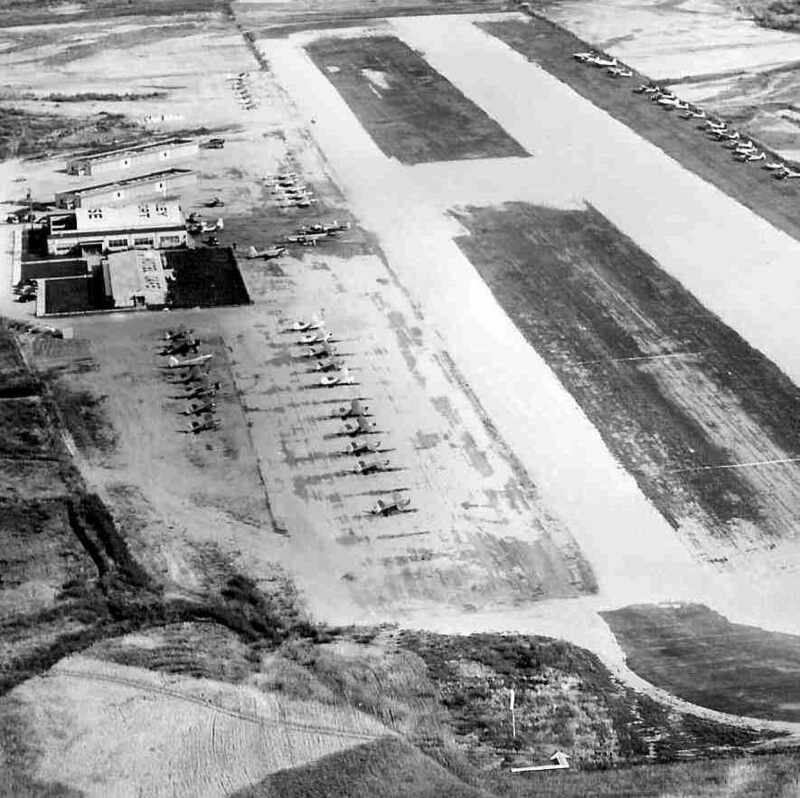 The larger Boise Airport (also known as Gowen Field) opened in 1938, at which point the original Boise Airport (Booth Field) presumably ceased operations. by which point only the replacement Boise Airport (Gowen Field) was depicted. with Bronco Stadium occupying the eastern portion of the airport site. 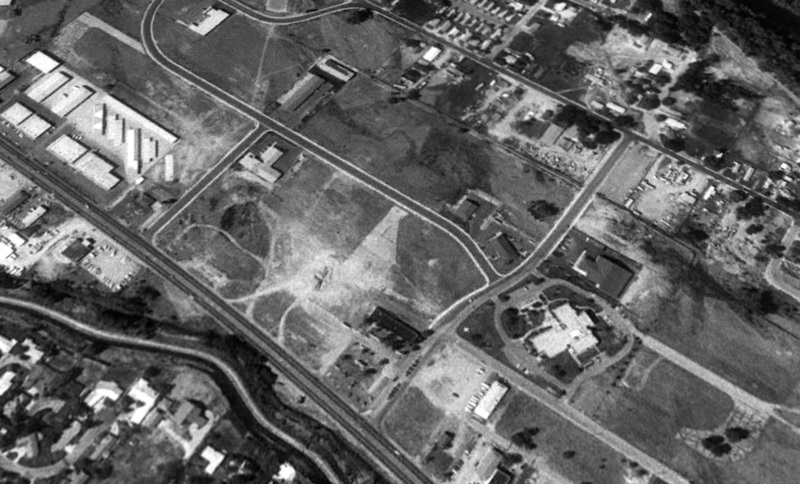 A 1971 aerial photo showed no trace remaining of the original Boise Airport. 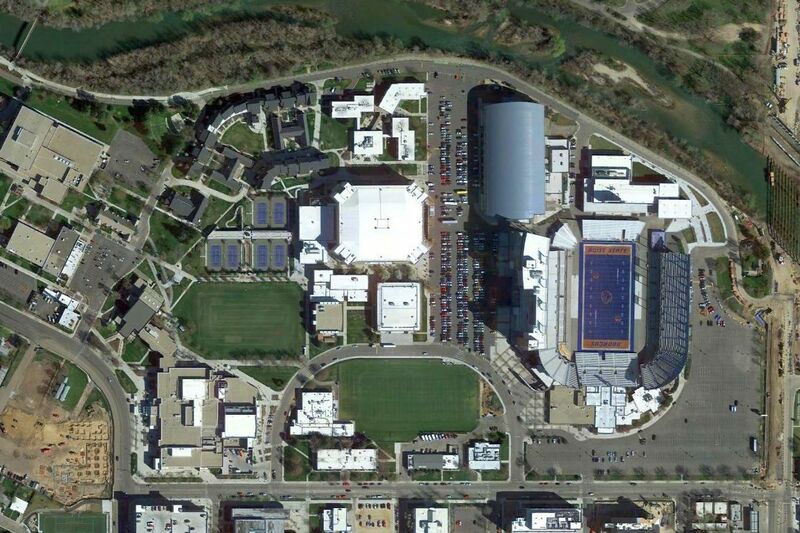 occupied by Taco Bell Arena & Albertsons Stadium. Thanks to Blain Green for pointing out this airfield. 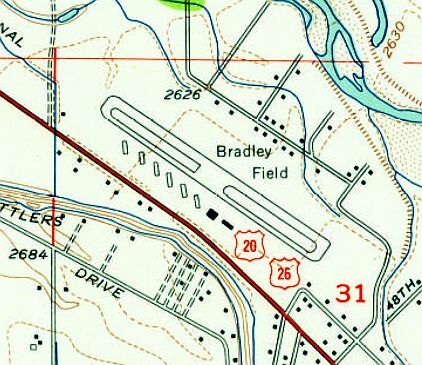 Glider Air Park, as depicted on the 1976 USGS topo map. nor on the 1971 USGS topo map. 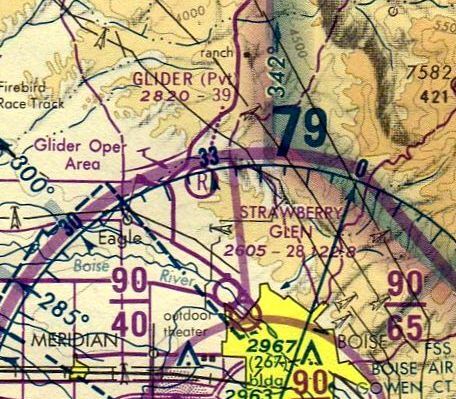 The earliest depiction which has been located of Glider Air Park was on the 1976 USGS topo map. Jay Camp (former Boise Airport ATC) recalled, “That property was once owned by the Terteling family. They own the Terteling Cocompany headquartered in Boise. The older Terteling son was interested at one time in designing & building his own experimental aircraft. So he had that runway & the hangar with 2 outbuildings built. According to Rick Bier, “Glider Air Park was located in a very poor location with hills on the north, south & east. It was in the bottom of draw coming out of the foothills. It was a strictly one-way strip. Sailplanes took off to the west via catapult & landed to the east. 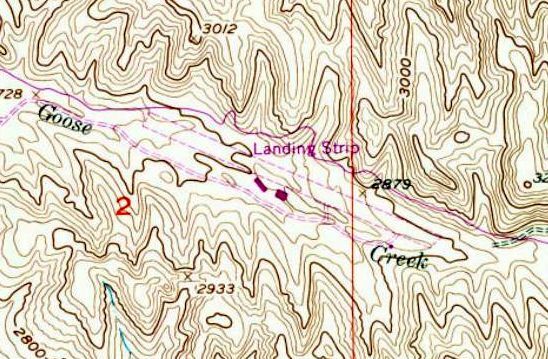 labeled simply as “Landing Strip”, squeezed very uncomfortably close by canyon walls on both sides. Two small buildings were depicted on the south side. 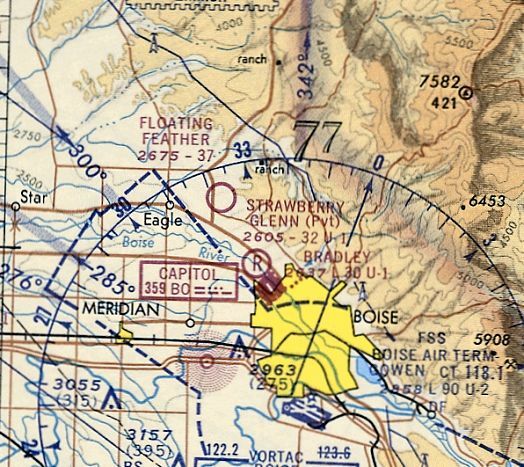 The only aeronautical chart depiction which has been located of Glider Air Park was on the April 1980 Salt Lake Sectional Chart (courtesy of Mitchell Hymowitz). 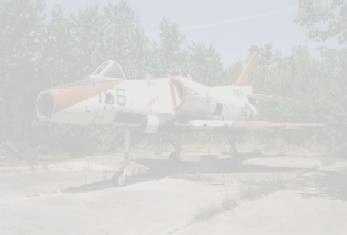 It depicted “Glider” as a private airfield having a 3,900' unpaved runway. Hill Road to the south, Seamans Gulch on the east side & Dry Creek Rd on the north) was turned over to Ada County. 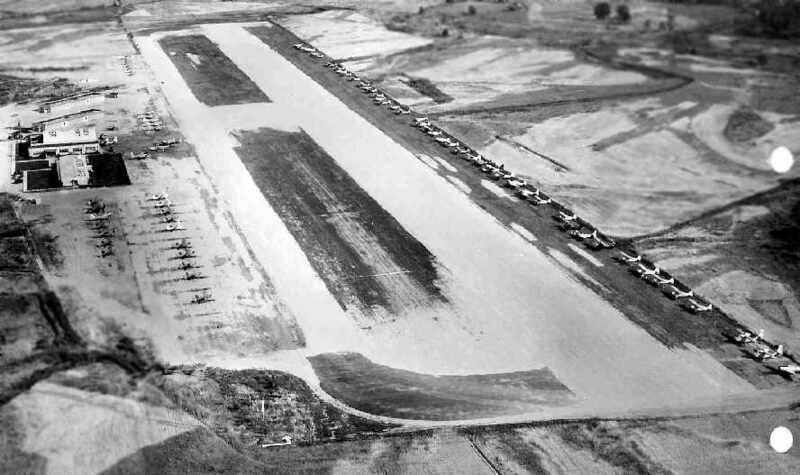 The only photo which has been located showing planes at Glider Air Park was a 1992 aerial view looking northwest. Four light single-engine planes were visible parked at the southeast corner of the unpaved runway. 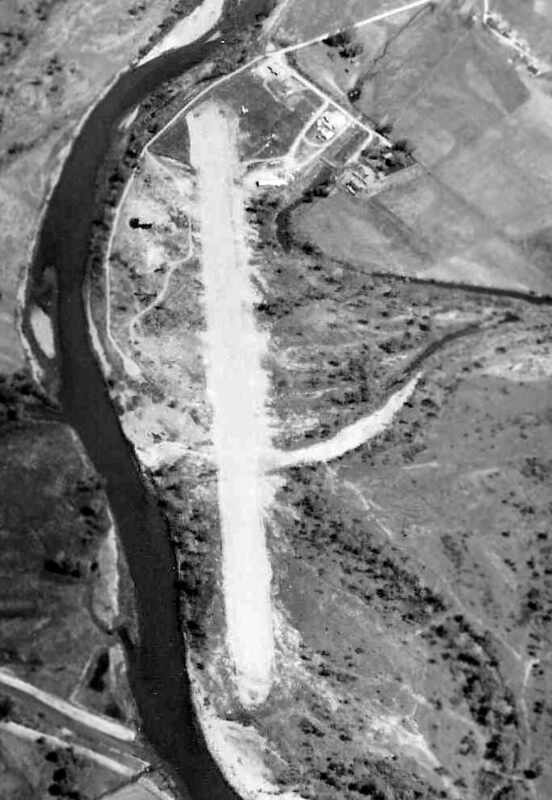 and a 1998 aerial photo showed a road having been built across the runway. A 2016 aerial view looking northeast showed the site of Glider Air Park is unrecognizable as ever having been an airfield. All traces of the runway are gone, along with the hangar which previously stood at the southeast end. Jay Camp reported in 2018, “Currently this airpark is now in the Ada County Solid Waste Landfill property. Those building have various uses now. But the former hangar was actually done really nicely. It had the open-space hangar for aircraft (of course), back rooms for parts, engine assembly & small offices. The site of Glider Air Park is located at the eastern terminus of West Goose Creek Road. Thanks to Rick Bier for pointing out this airfield. Boise Air Park, as depicted on the 1947 ID Aeronautical Chart (courtesy of Bob Pearson). 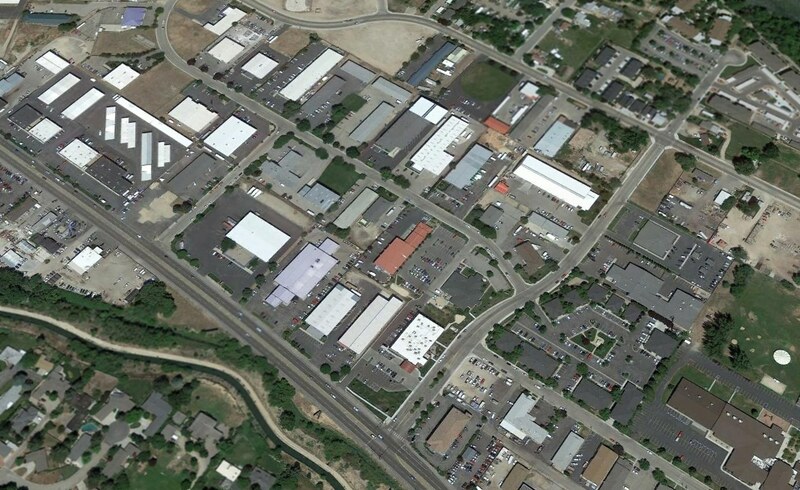 This small general aviation airport was one of several (up to 5) which were located at one point within the Boise area. was on the 1947 ID Aeronautical Chart (courtesy of Bob Pearson). Boise Air Park (and 4 other Boise area airports) as depicted on a circa 1948 ID Airports Map (courtesy of Jeff Anderson). with a single building on the east side. 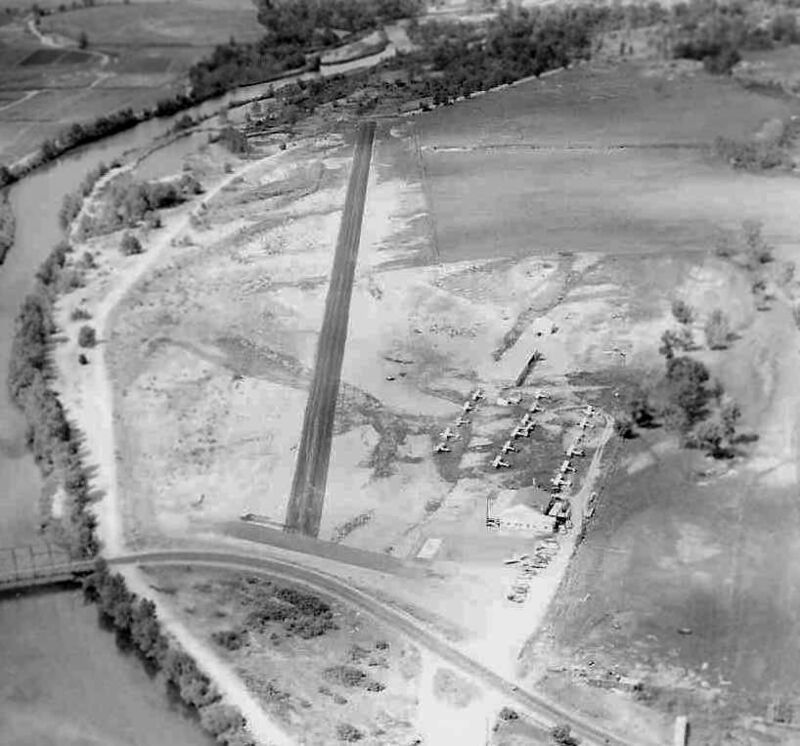 The earliest photo which has been located of Boise Air Park was a 1949 aerial view (courtesy of Don Watts). 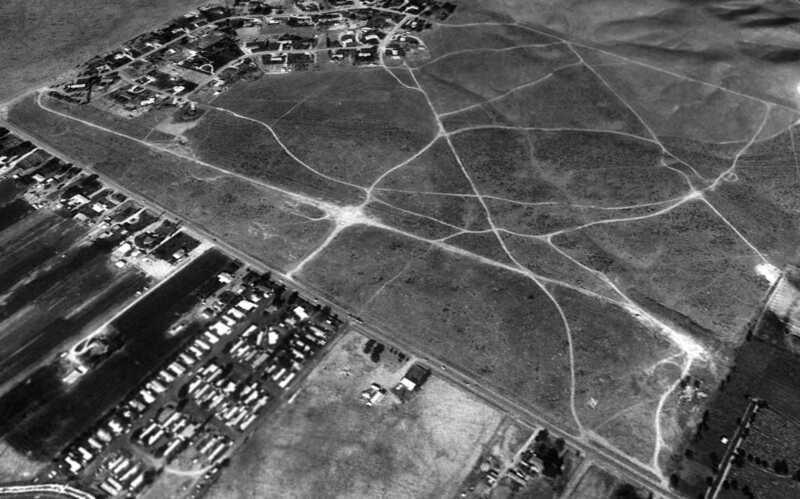 It depicted Boise Air Park as having a single unpaved northwest/southeast runway, with a few buildings & some light aircraft along the southeast side. was an August 1952 aerial view looking north from Wayne White's “A History of Aviation in Idaho 1940-1970” (courtesy of Jeff Anderson). 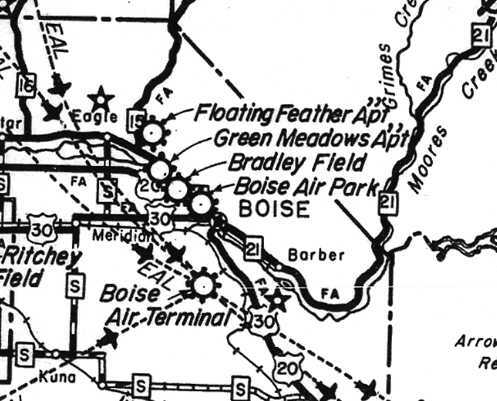 It depicted Boise Air Park as having a single northwest/southeast runway, along which were visible a total of 34 light aircraft. was on the 1953 Boise Sectional Chart (courtesy of Chris Kennedy). which may indicate that it was closed by that point. The specific reason for its closure has not been determined. 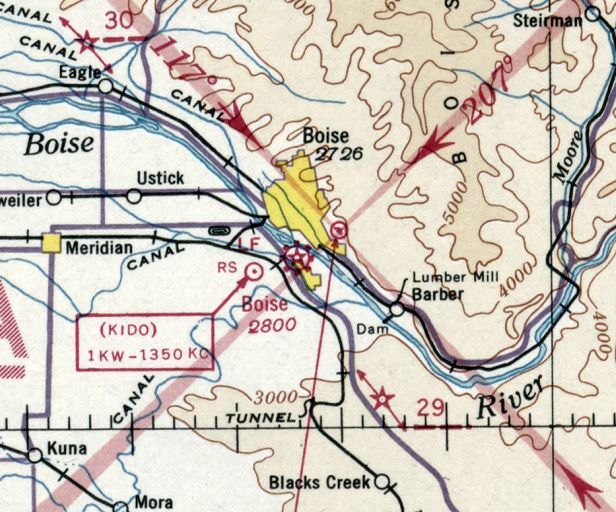 Boise Air Park was closed by 1958, as that is how it was depicted on the 1958 USGS topo map. 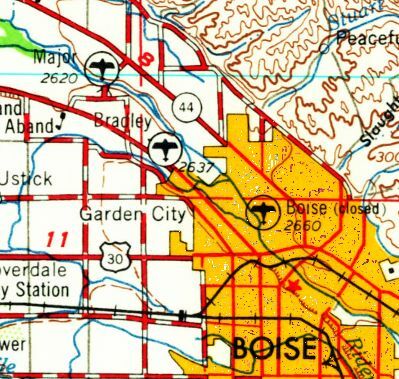 Boise Air Park was no longer depicted on the 1967 Boise Sectional Chart (courtesy of Chris Kennedy). with the northern half having been covered by a pond, and the southern half remaining open land. 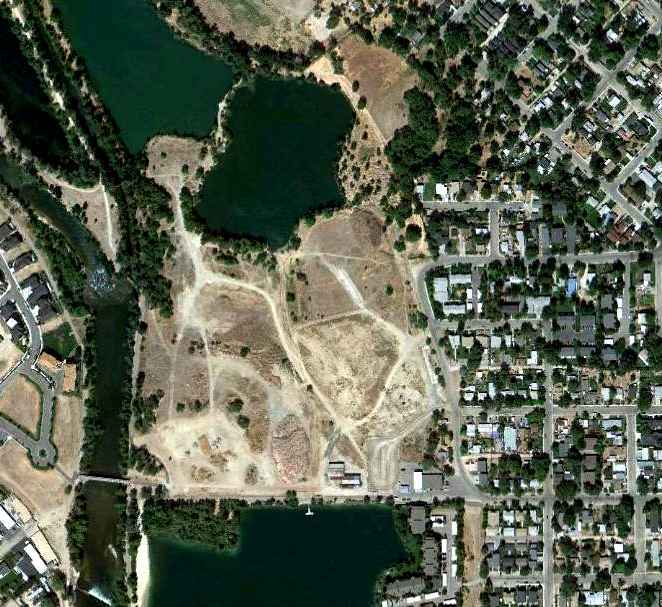 Jay Camp reported in 2015, “Boise Air Park was located where the new Ester Simplot Park is currently being built, between Quinns Pond & Veterans Park. The site of Boise Air Park is located west of the terminus of Hester Street. 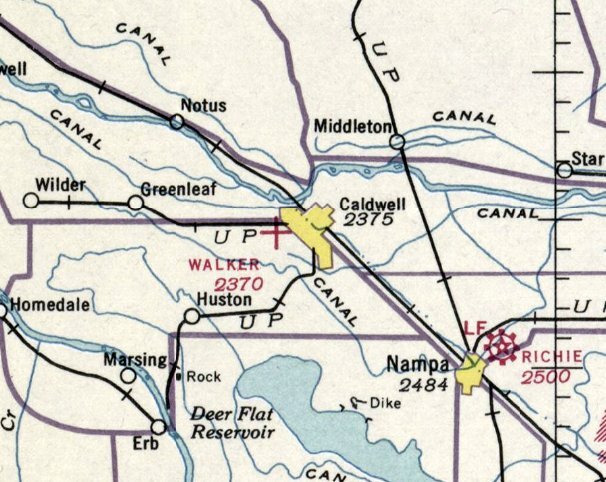 Walker Field, as depicted on the 1930 Rand McNally Air Trails Map (courtesy of Chris Kennedy). with the permission of M.L. Walker (landowner). parcel for 160 acres total in 1928 to be used as a municipal airport. Varney Air Lines (predecessor of United Air Lines) used Caldwell's Airport when the Boise Airport was fogged in. Webb's hangar & 4 aircraft were destroyed by fire on May 22, 1929.
was in the November 1929 Standard Oil of CA Airplane Landing Fields of the Pacific West (courtesy of Chris Kennedy). It described Walker Field as a commercial airport having a 4,300' east/west runway. was on the 1930 Rand McNally Air Trails Map (courtesy of Chris Kennedy). having 4 runways, with the longest being the 3,500' northwest/southeast strip. 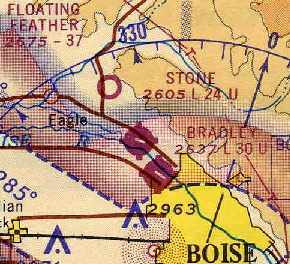 The earliest aeronautical chart depiction which has been located of Walker Field was on the January 1936 Boise Sectional Chart. 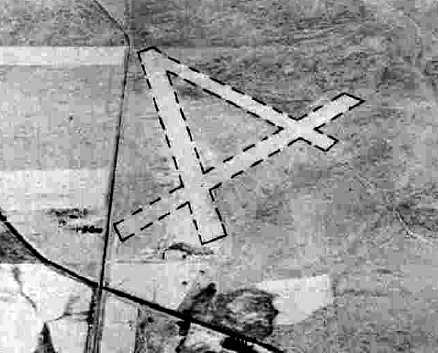 It depicted Walker as an auxiliary airfield. The Airport Directory Company's 1937 Airports Directory (courtesy of Bob Rambo). with a building on the southeast side of the field. sponsored by the College of Idaho & Civil Aeronautics Administration, began. It depicted Douglas Airport as having 2 unpaved runways. with hangars on the south & east sides of the field. 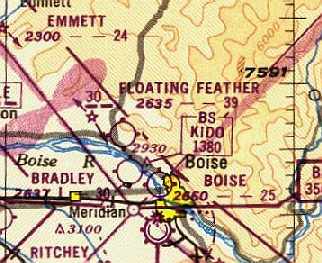 The 1944 Boise Sectional Chart (courtesy of Chris Kennedy) depicted Caldwell as a municipal airport. as a 160 acre square property within which were two 3,200' unpaved runways, oriented northeast/southwest & northwest/southeast. The field was said to have 4 hangars, the largest of which was an 80' square concrete & wood structure. Wardwell Municipal Airport was described as being owned & operated by the Town of Douglas, and to operated by the Civil Aeronautics Administration. depicted Caldwell as having a 2,400' unpaved runway. described Caldwell as having a 2,400' hard-surface runway. 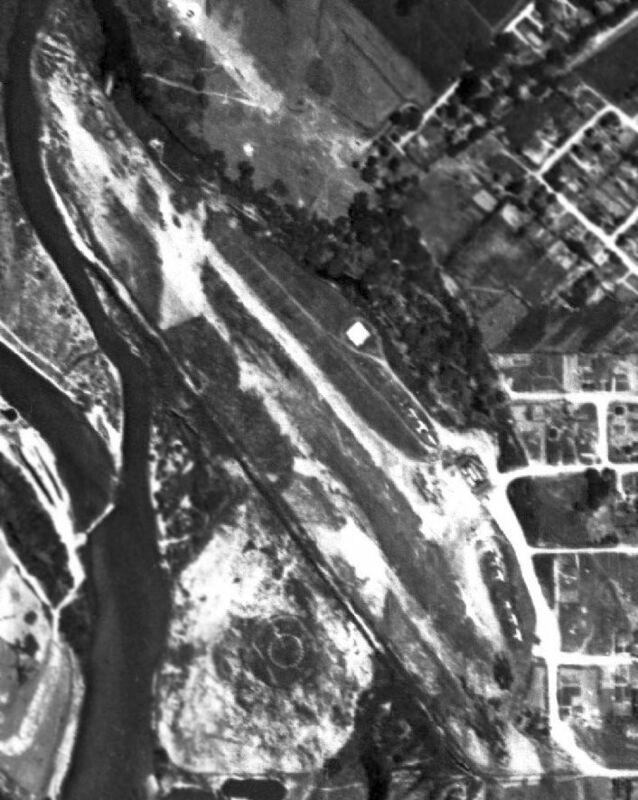 A 7/22/53 USGS aerial photo showed Caldwell as having a northwest/southeast runway. as having a northwest/southeast paved runway with a ramp on the east side. with taxiways leading to several hangars along the east side of the field. 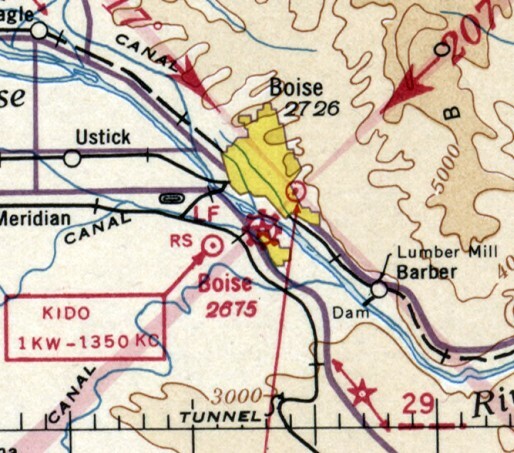 The last aeronautical chart depiction which has been located of Caldwell Airport was on the May 1969 Boise Sectional Chart. 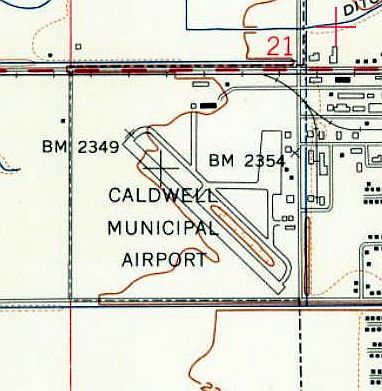 It depicted Caldwell as having a 3,00' paved northwest/southeast runway. and [replaced by a new airport] 2 miles southeast, named the Caldwell Industrial Airport. This move was due to safety as the Caldwell Hospital had been built close to the end of Runway 12. Caldwell Municipal Airport was presumably closed upon the opening of the new airport. 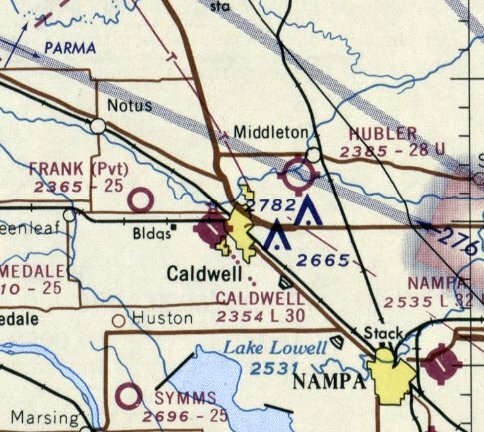 which instead depicted the new Caldwell Industrial Airport to the southeast. even though it had evidently been closed already for a decade. Stan Siewert reported about Caldwell Municipal Airport, “The runway was used informally as a drag strip in the early 1980s. 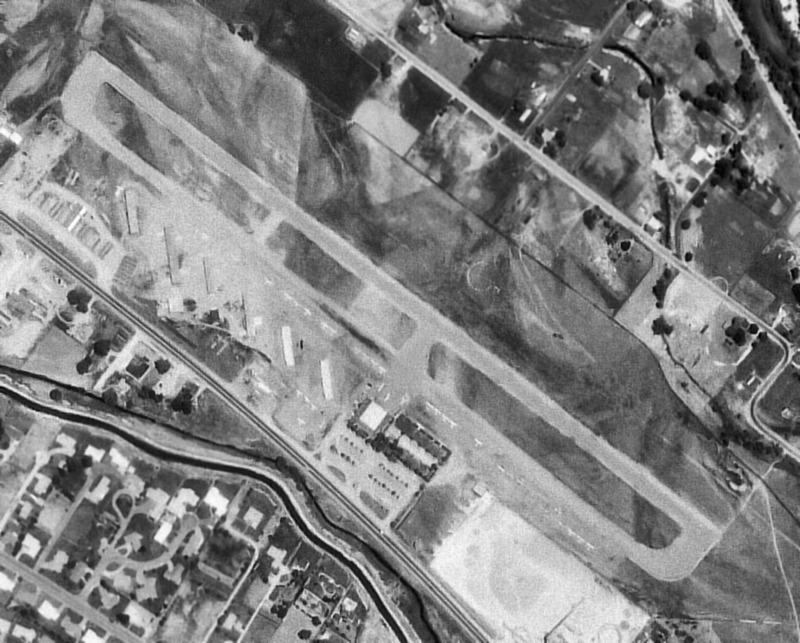 A 1992 USGS aerial view looking north showed much of the runway & parallel taxiway of Caldwell Municipal still existed. running to the road along the west side of the property. It does not appear as if any of the original airfield buildings or hangars remain standing. leaving the runway segment on the southeast end as the only recognizable trace at the site of the former airport. with only traces of the southeast end of the runway still recognizable. The site of Caldwell Municipal is located southeast of the intersection of Route 19 & Farmway Road. 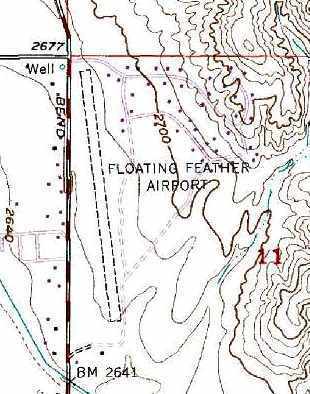 depicted Floating Feather Airport as having 3 unpaved runways. as it was not yet listed among active airfields in The Airport Directory Company's 1937 Airports Directory (courtesy of Bob Rambo). was an 8/23/43 aerial view looking north from the 1945 AAF Airfield Directory (courtesy of Scott Murdock). It depicted Floating Feather Airport as having 3 unpaved runways. described Floating Feather Airport as having a 3,800' unpaved runway. was on the December 1944 Boise Sectional Chart (courtesy of Chris Kennedy). According to Marian Woods, her father-in-law Bill Woods was a “back-country pilot & owner of the Floating Feather Airport. The airport burned in WWII when a plane crashed... the plane was a bomber. Bill trained many pilots for the war. as a 240 acre rectangular property within which were 3 earth runways, the longest being the 3,800' NNW/SSE strip. The field was said to not have any hangars, and to be privately owned & operated. Floating Feather Airport (and 4 other Boise area airports) as depicted on a circa 1948 ID Airports Map (courtesy of Jeff Anderson). 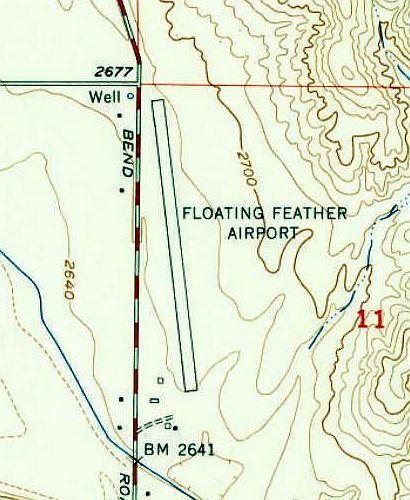 depicted Floating Feather Airport as having a 3,900' unpaved runway. A 1960 aerial view looking east at Floating Feather Airport (from the ID DOT Department of Aeronautics, via William Womack). with a small building & several 20 light aircraft on the southwest side of the field. showing at least 6 light aircraft on the field. 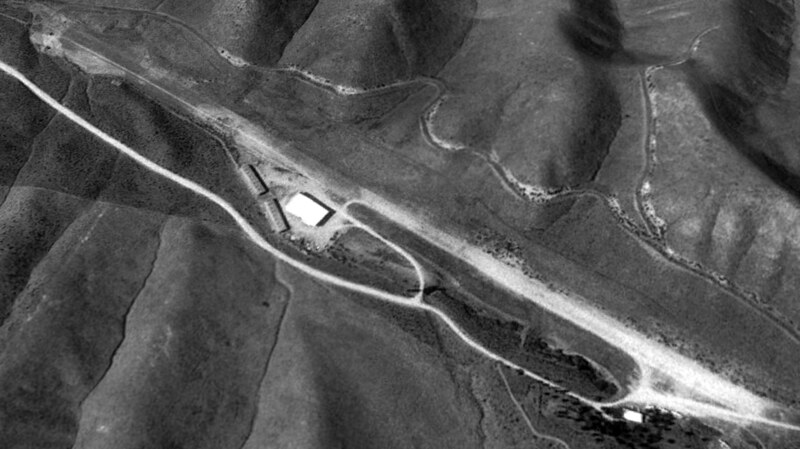 A 1971 aerial photo showed one light aircraft parked on the southwest side of Floating Feather Airport. but that does not necessarily prove that the field was still operating at that point. 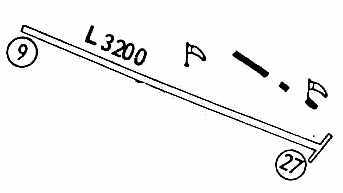 It was depicted as having a single north/south runway. 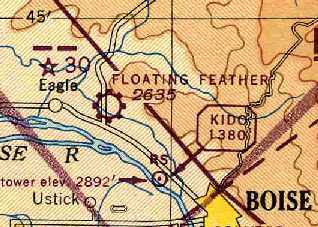 Floating Feather Airport was no longer depicted on the April 1980 Salt Lake Sectional Chart (courtesy of Mitchell Hymowitz). 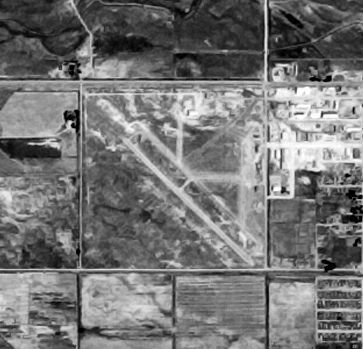 as a 1992 USGS aerial view looking northeast shows that the airport buildings had been removed. The runway remained intact but deteriorated. 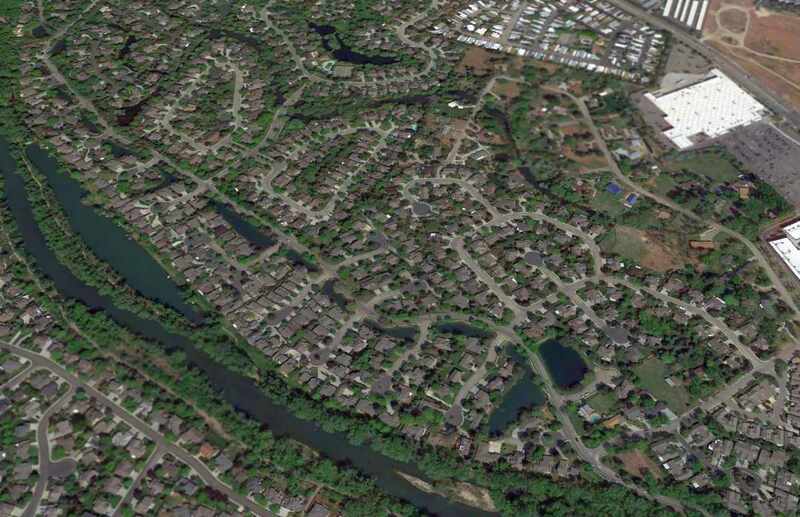 A 1998 USGS aerial view shows that houses had been built over the site of Floating Feather Aiport. Jay Camp reported, “I [was] ATC from BOI, and also was their airspace/procedures specialist for BOI. A 2015 aerial view looking northeast showed no trace remaining of Floating Feather Airport. of Route 55 & East Floating Feather Road. 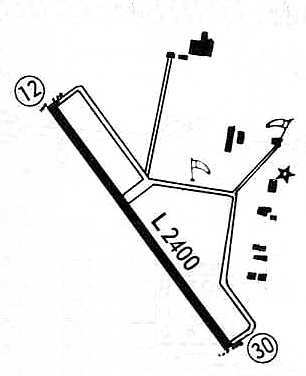 "Green Meadows" Airport, as depicted on the 1947 ID Aeronautical Chart (courtesy of Bob Pearson). This small general aviation airport apparently went through numerous names throughout the course of its 3 decades. 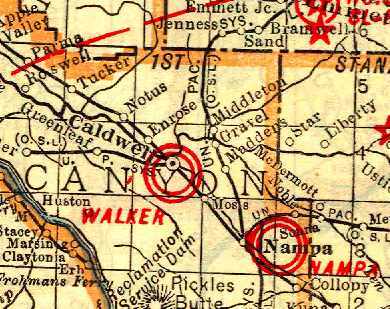 not depicted on the April 1946 Boise Sectional Chart. “The airport was constructed in 1946. It was owned by Theodore Thomas & W. A. Spivey. which labeled it as "Green Meadows" Airport. 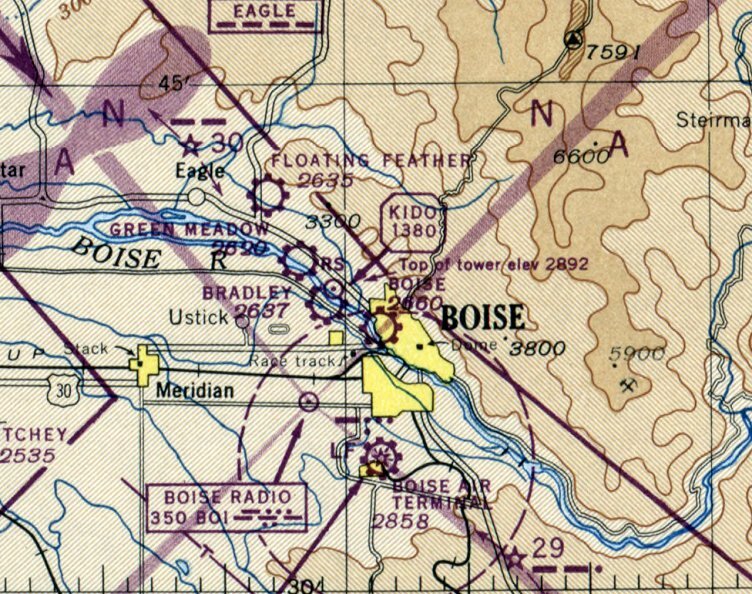 The May 1948 Boise Sectional Chart (courtesy of Chris Kennedy) depicted "Green Meadow" as a commercial or municipal airport. Green Meadows Airport (and 4 other Boise area airports) as depicted on a circa 1948 ID Airports Map (courtesy of Jeff Anderson). 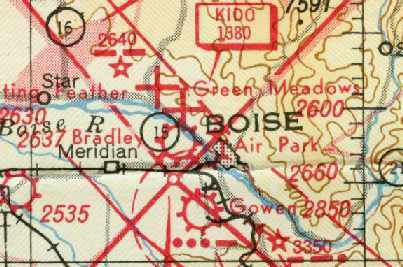 Green Meadow Airport as depicted on the May 1948 Boise Sectional Chart. 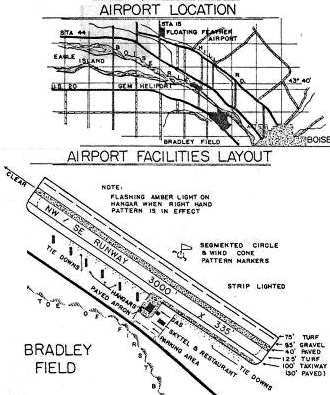 A 1952 FAA diagram (courtesy of David Field) depicted Major Airport as having a single 2,000' turf & bare Runway 9/27. A shop building was depicted on the northeast side of the field. 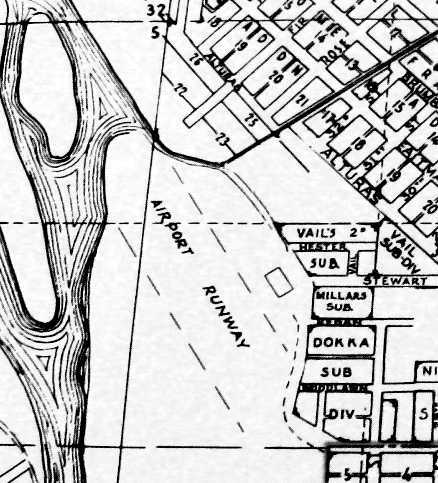 The 1953 USGS topo map depicted Major Airport as having a northwest/southeast runway, with 2 small buildings on the east side. An undated (circa 1950s?) aerial view looking northwest at Major Airport (from the ID DOT Department of Aeronautics, via William Womack). with a few small buildings & a few light aircraft on the northwest side of the field. 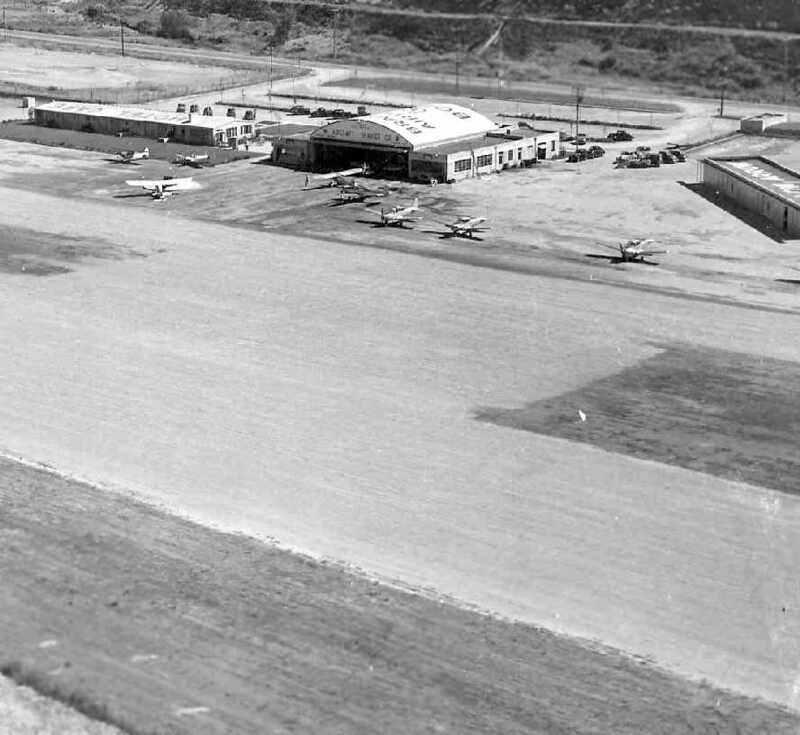 in 1959 as “Dovell Airport”, and in 1960 as “Gem Heliport”. A 1962 aerial view looking northwest at Stone Airport (from the ID DOT Department of Aeronautics, via William Womack). with a building & over 20 light aircraft on the northeast side of the field. in 1963 the airfield was reported as “Stone Airport... owned by Stone Aviation. with 3 buildings along the northeast side of the field. The field was also said to have helicopter activity. depicted "Stone" Airport as having a single 2,400' paved runway. in 1969 Strawberry Glen Airport was owned by Jack Hoke, Helicopters Inc.
but its status was changed to a private airfield. 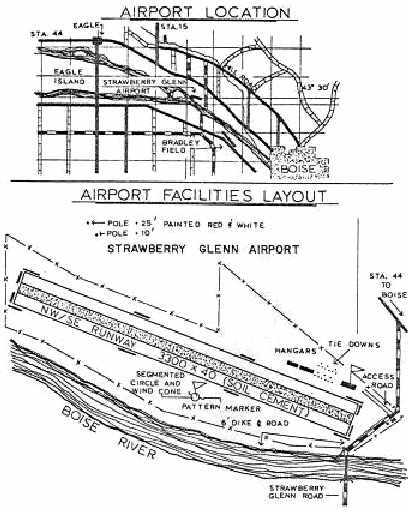 depicted Strawberry Glenn Airport as having a single 3,000' "soil/cement" runway, oriented northwest/southeast. Three hangars were located north of the east end of the runway. 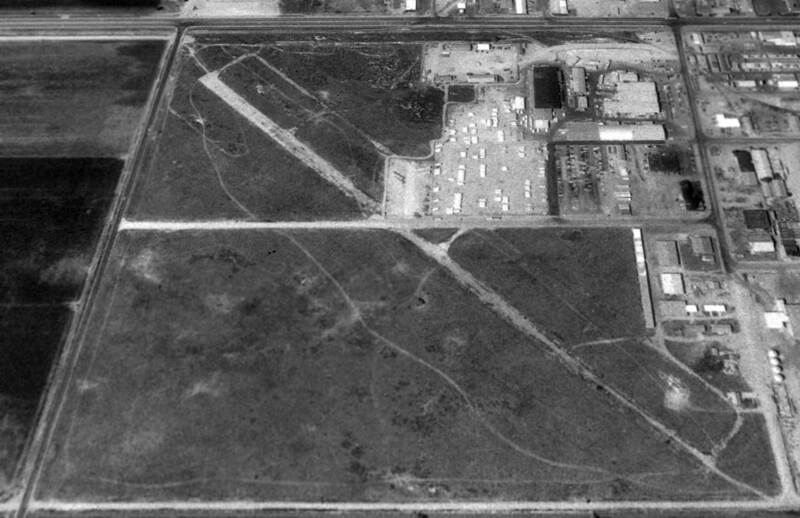 The field was described as a "helicopter repair station", operated by Helicopters Inc.
A 1973 aerial view looking northwest at Strawberry Glenn Airport (from the ID DOT Department of Aeronautics, via William Womack). with several buildings & a large number of light aircraft on the northeast side of the field. Ponderosa Aero Club was formed in 1974 at Strawberry Glen Airport. received his initial training at Strawberry Glen according to his website." 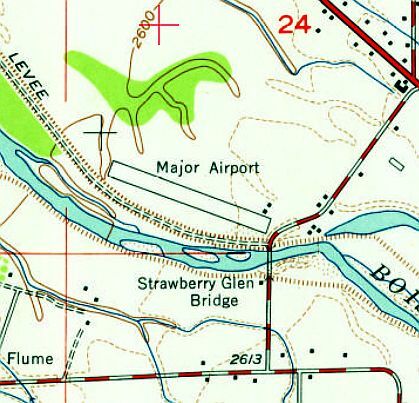 Strawberry Glen Airport, as depicted on the 1976 USGS topo map. “In 1977 it was inspected because there was a runway length discrepancy between various records. 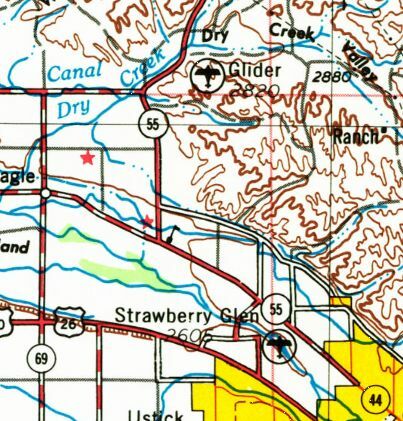 depicted Strawberry Glenn as having a single 2,600' Runway 10/28. 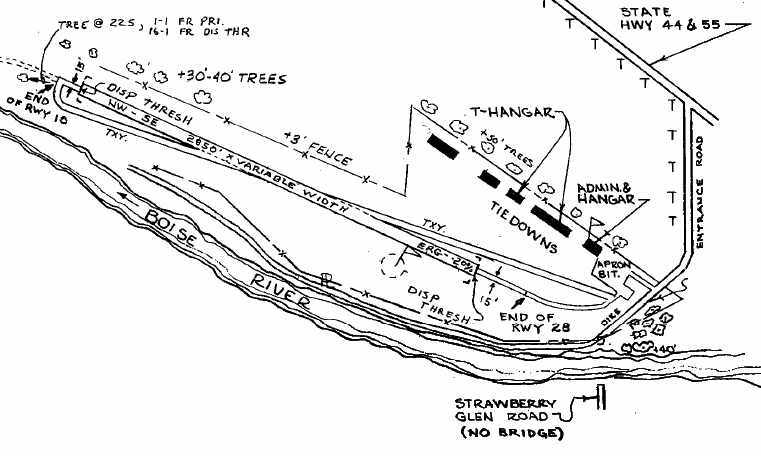 A 1978 FAA diagram (courtesy of David Field) depicted Strawberry Glenn Airport as having a single 2,850' asphalt treated runway. 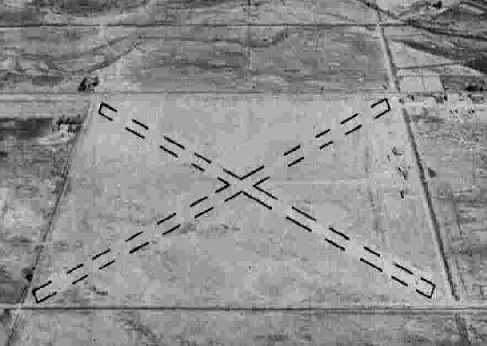 An apron with several T-hangars was depicted on the northeast side of the field. which may indicate that the field was closed by that point. was on the April 1980 Salt Lake Sectional Chart (courtesy of Mitchell Hymowitz). It depicted Strawberry Glen as having a 2,800' unpaved runway. as it was no longer depicted at all on the 1981 USGS topo map. with not a trace remaining of the airfield. 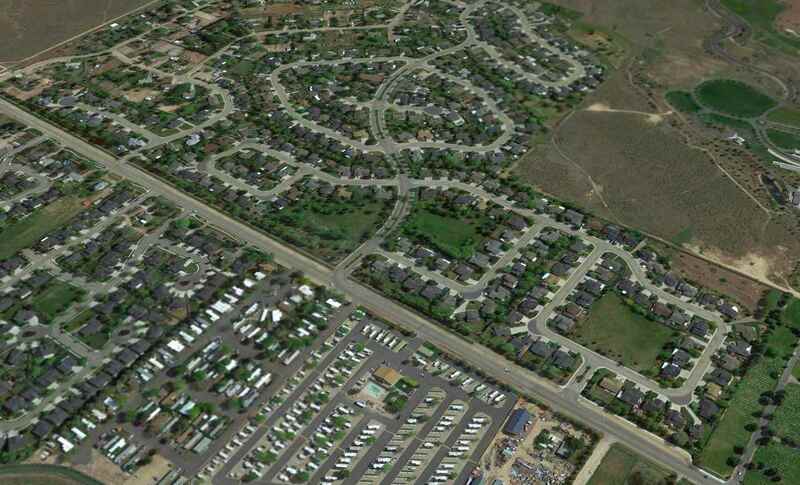 A 2015 aerial view looking northwest showed no trace remained of Strawberry Glenn Airport. of North Strawberry Glenn Road & West Riverside Drive. 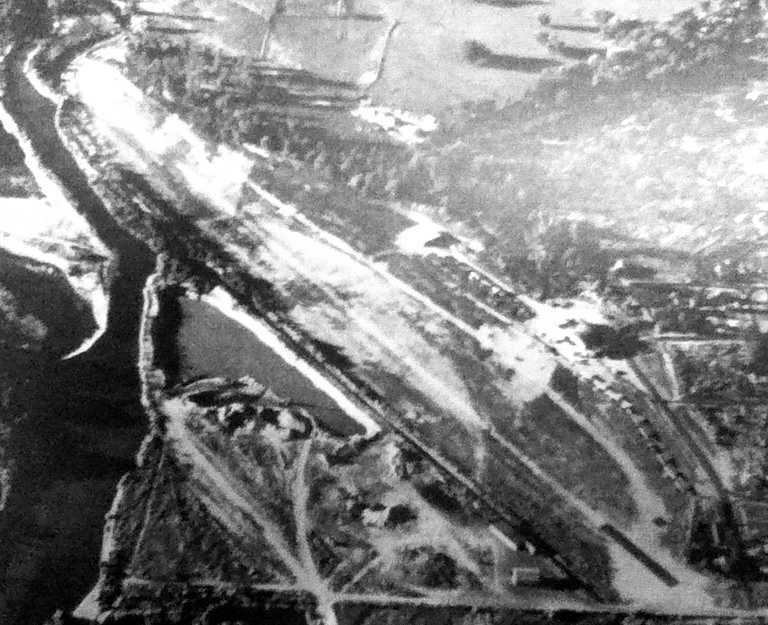 A July 1946 aerial view by Ansgar Johnson of Bradley Field as it was nearing completion (courtesy of Robert Pearson). which had previously operated from College Field. 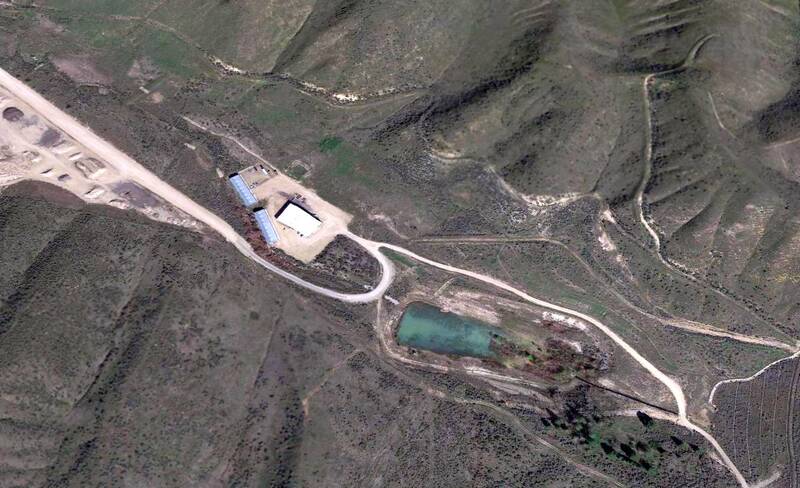 approximately 2 miles northwest of Boise, for the purpose of building a replacement airport. The new airport was named for Jack Bradley, President of the Aircraft Service Company. 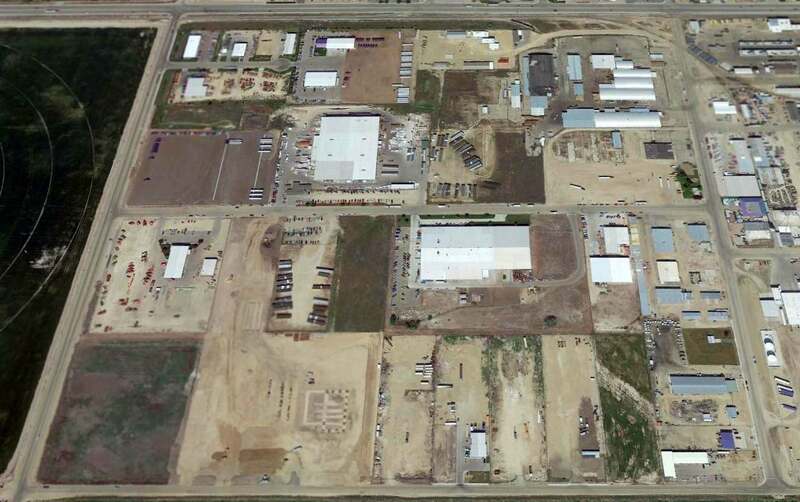 Construction of Bradley's 3,000' x 400' runway was done by the Morrison Knudsen Company. which would appear to be the same airport as Bradley Field. with the manager listed as Phil Cox. along with a 120' x 80' hangar. Completion of the initial construction at Bradley Field was reportedly made during the summer of 1946. 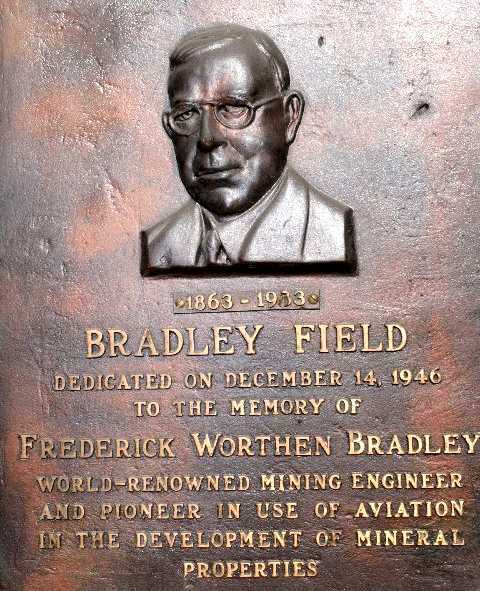 Bradley Field was dedicated on 12/14/46 to Frederick Bradley (a 2008 photo by John Bradley of a historic plaque). John observed, Frederick Bradley was “my grandfather whom the airport is dedicated to. They had mines in Idaho & in the winter they were only accessible by air at times. 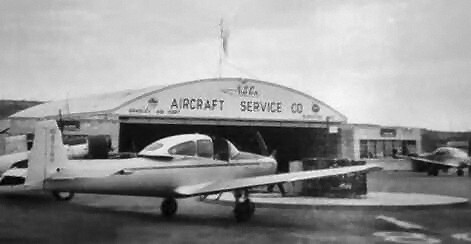 A circa 1946-50 photo (courtesy of John Bradley) of a Navion in front of an Aircraft Service Company hangar at Bradley Field. The Aircraft Service Company achieved national recognition as a sales distributor for the North American Navion. The company's volume made it a national sales leader for Navion aircraft in the 1946-47 period. 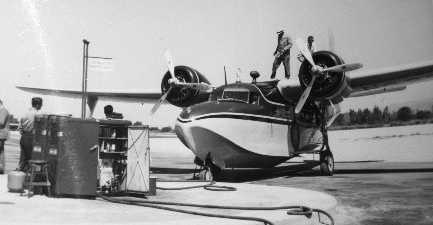 A circa 1946-50 photo (courtesy of John Bradley) of a Grumman amphibian being refueled at Bradley Field. depicted Bradley as a commercial or municipal airport. Bradley Field (and 4 other Boise area airports) as depicted on a circa 1948 ID Airports Map (courtesy of Jeff Anderson). An undated aerial view looking north at Bradley Airport (courtesy of Robert Pearson). in front of a hangar of the Aircraft Service Company at Bradley Airport (courtesy of Robert Pearson). depicted Bradley as having a 3,000' unpaved runway. 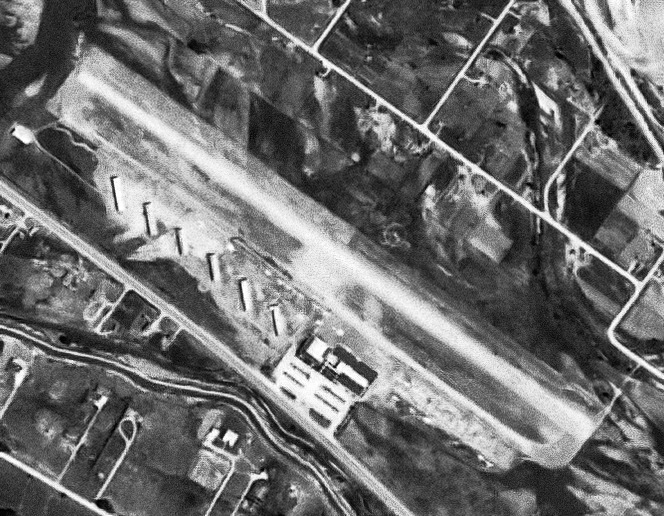 A 7/22/53 USGS aerial view depicted Bradley Field as having a single northwest/southeast runway, with a row of hangars along the west side. A September 1954 advertisement for Bradley Field, “The Northwest's #1 Stopover” (courtesy of Michael Dennis). with a huge number of light aircraft on both sides of the field. A closeup from the undated (circa 1950s?) aerial view looking west at Bradley Field (from the ID DOT Department of Aeronautics, via William Womack). described Bradley Field as having a 3,000' unpaved runway. 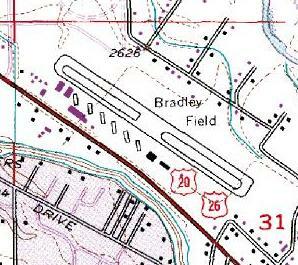 The 1953 USGS topo map depicted Bradley Field as having a northwest/southeast runway & a parallel taxiway along the southwest side. A row of hangars was located along the southwest side of the taxiway. An undated (circa 1960s?) 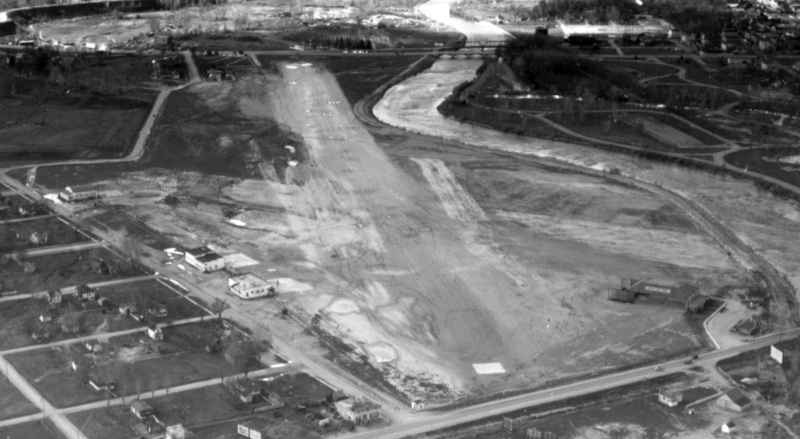 aerial view looking south at Bradley Field (from the ID DOT Department of Aeronautics, via William Womack). with 3 Navions & several taildraggers on the ramp. The building on the left was marked “Hotel Cafe” on its roof. depicted the field as having a single 3,000' paved runway. with a paved parallel taxiway along the southwest side. and the "Skytel & restaurant" were located next to a paved apron. The manager was James Sparks. However, the end was near for Bradley Field, as the remarks said, "Future status undetermined at this time. Future expansion as a reliever airport." The last photo which has been located showing Bradley Field still in operation was a 7/12/71 USGS aerial view. Bradley Field appeared to be quite healthy, with over 2-dozen light aircraft visible parked outside. Unfortunately, instead of being expanded, Bradley Field was closed in 1973. Its last operator was Capital Flying Service. even though it had apparently already been closed for 6 years by that point. 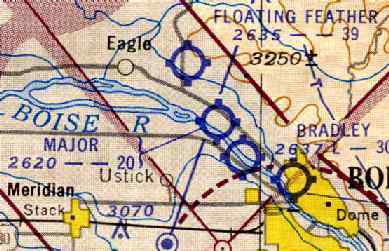 Bradley Field was depicted as an abandoned airfield on the April 1980 Salt Lake Sectional Chart (courtesy of Mitchell Hymowitz). 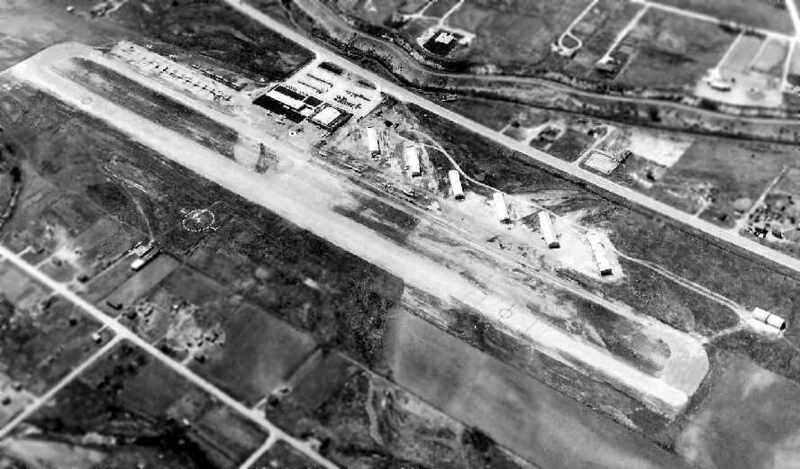 two streets (Sawyer Avenue & 52nd Street) had been built over the middle portion of the airfield. What appeared to be several small hangars also still remained erect, on the west side of the field. and is looking for further information on the property's history. A 2017 aerial view looking north showed that additional buildings had covered the remaining traces of Bradley Field's runway. However, several 60 year-old hangars still remained intact, on the west side of the field (top-left of photo). The site of Bradley Field is located northwest of the intersection of West Chinden Boulevard & 52nd Street.